Today I am going to talk briefly about user permissions. User accounts are different than logins. Logins are server level accounts that grant access to a SQL Server. User accounts handle permissions to databases and the objects contained in them. This is useful but not what we are looking for. This is a list of all principals within my adventureworks database. Other fields included in this table are the SID and create/modify dates. Default schemas allow a user to not include the schema for an object in T-SQL. For example, assume table1 was in the schema dbo. Dbo could execute select * from table1, but guest would have to execute select * from dbo.table1. More on schemas in another post. 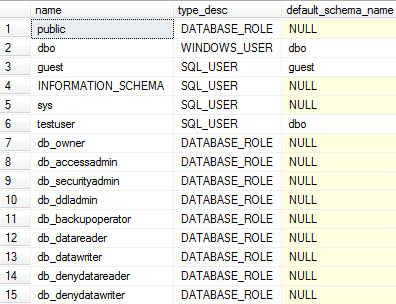 Take a look at the bottom row, this is saying that the user, testuser, has select permissions on the schema dbo. There are three settings for permissions. They are GRANT, REVOKE, and DENY. Grant gives permission to a user. Revoke removes permission to a user. Deny will prevent the specified action on an object, even if it’s inherited from another permission. Note: There is a thing called a guest user, you almost never want it enabled. Always read through Books Online if you are thinking of turning it on. Generally, just create an account with the least priviledges needed to perform the task necessary. ← SSIS or SQL Server Maintenance Plan ~ TCP Provider, error: 0 – The semaphore timeout period has expired. Two of the coolest tools that have ever come out from Microsoft are certainly Microsoft SQL Server and Microsoft Access. Microsoft Access databases have certainly become more prevalent over the last 2 years as large corporations break the imposed ban on using the tool. Many of our large corporate clients and government clients have stymied development in Microsoft Access for varying reasons which can include security issues or simply the IT Managements belief that they don’t want to support the application.